Out of college, I wanted to illustrate greeting cards for Hallmark (yeah, I’m kinda touchy-feely). While my dream didn’t exactly come to fruition as I had planned, I did end up creating my own greeting card line and had a mini online store. Sales weren’t exactly brisk – but it was fun to have my work out there for public consumption. Do you have a desire to sell your own goods or other products online? Well, it’s really not as hard as you may think. The internet has truly opened up a whole new world to merchants everywhere. An individual living in Small-town, Iowa can sell directly to a person in Big-city India. There really are no limits to where you can sell now. Assuming you have already figured out your product’s unique selling proposition, start by obtaining a domain name. It’s best to include the product category – if you can – in the domain. For example, “acegreetings.com” or “acegreetingcards.com”. This will help you get found in online search. Decide what which products of yours you will sell and then write descriptions for each. Your copy should be easy to read and inspire folks to purchase your product (without being too fluffy). You’ll also want to do some price comparisons online to see what others are selling similar items for. There are a lot of online CMS (content management system) solutions to choose from. These will give you an edge in a very tight and competitive online marketplace. Just because you open up your shop, doesn’t mean anyone will come. You’ll need to start with a platform that is optimized and ready to perform in search. One that I have done some research looking into of late is called Shopify. They really make the whole online store set-up process very easy and have loads of benefits, including: customizable store design, secure shopping cart (very important to have when selling online), will host the store for you and provide you with ad dollars to promote your store. While they are not free – they do have monthly pricing options to fit each individual needs. 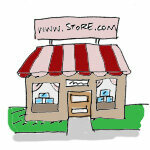 Once you have your online store operational – spread the word! Use your network of family and friends to help share your product. They will likely be your best ambassadors. Also, get social. Use social media to attract new followers. You may also want to provide a press release to your local newspaper, possibly with notice of a “grand opening” sale. Money spent on online continues to grow every year – and folks are always on the lookout for something new and unique. Your product could just be what they’ve been waiting for! Good luck and happy selling! How cool that you had your own little greeting card business. Even if it didn’t work out, you probably learned a lot in the process. I read recently that online shopping has grown from 2% of total shopping 12 years ago to 8% today. If you expand that out a decade or two, we’re only going to go online more. This could be a great opportunity to make some side income if you have a special skill at making something. Great stat.. I’m sure it’s only going up. I think the key is to specialize – offer something that folks can’t really find elsewhere.